One of the big problems of this smartphone age we're living in is constituted by people's propensity to use their handsets while driving a car or riding a bike. This results in distracted driving (or riding), and that can often lead to accidents, even of the fatal kind. Samsung is now working on something that it believes might help. 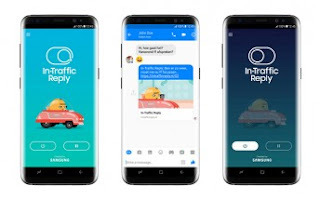 It's called In-Traffic Reply and it's an Android app that is currently in development, and is set to become available in mid-May through the Google Play Store. It will help reduce the social pressure to respond - the one that people feel whenever they get calls or messages while on the road. In-Traffic Reply will automatically activate when it detects you're driving or riding, using the phone's sensors. Then, when you get a call or a message, it will send the person trying to reach you an automated response. You can leave the default reply intact ("I'm driving, so I cannot answer at the moment") or create your own personalized version - including one that uses fun animations.